Urgent situation, 8 to 9 Feral Cats in danger. I write this with a heavy heart as 8 to 9 feral cats are in danger of going to the shelter. Their caretakers home was foreclosed on - the bank now owns the property. I am unsure how long they have until animal control is called as the property has been abandoned since the middle of January. I go every 2 days to feed and water them. They have a fence they can get in and out of, a plastic dog house with a tarp over it - I put straw in it before it snowed. There were 15 in all but I moved 6 to my backyard in hopes that they will learn this is their new home. I am unable to move them all. I can not have 14 to 15 cats, as we live by a highway, have dogs that are not cat friendly and my neighbors would have a fit. The cats are a result of neighbors not spaying/neutering. We knew the people that lived on the property - They were dog people but fed cats that were starved. Of course the cats set up shop in their backyard. 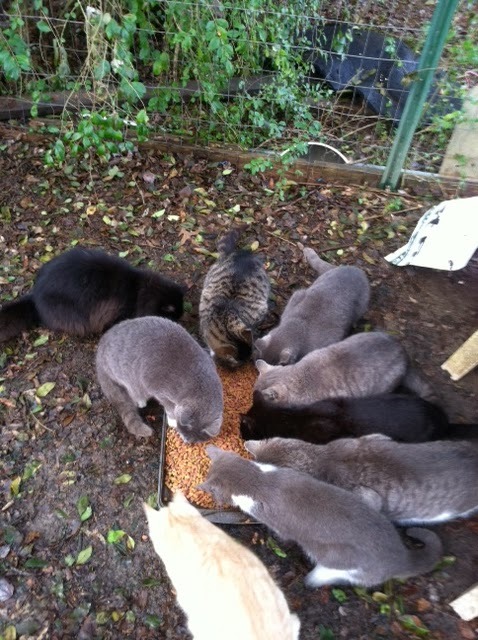 When we visited them last year they were inundated with kittens and had approximately 27. Some were killed when a neighbors 2 dogs got loose. I took it upon myself to have as many females as we could catch, spay. This was done through Sheets pet clinic and FCAP - both in Greensboro. Alamance county does not have a TNR program through the shelter or the humane society. All ferals are killed when they hit the shelter. There are some beautiful cats - including a black/ white long hair, a fluffy grey tabby, a black/grey tabby, a solid black, the majority are grey/white - there is also an older tom. The orange one in the picture is a neighbors cat. I realize these are wild cats. But I also know, after working with the 6 here, that they can be tamed with time. I'm praying I can find somewhere they can go, where they will be safe to live out their lives. If you can help in any way - Please let me know.